I apologize now for what I'm about to do. Some of you have been faithful readers for YEARS...and I hate to betray your good faith in me. BUT! This cake! Oh, this cake. German Chocolate cake has always been one of my very favorites, but I rarely make it because Jamie is allergic to coconut. Last weekend, he took the boys camping. Well, what do the Coller girls do when the Coller boys go camping? 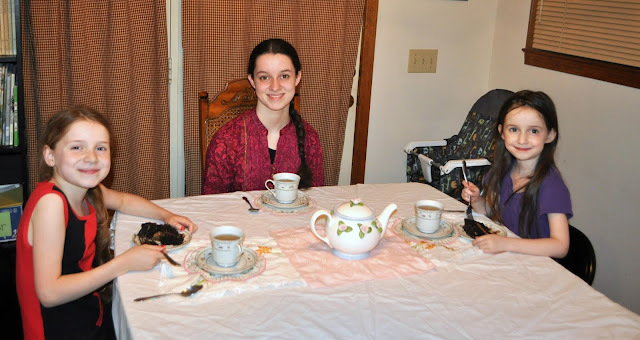 Why, we have a tea party and eat cake! 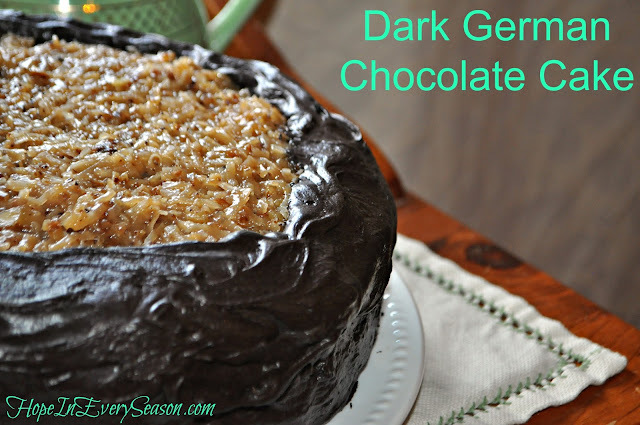 Contrary to what pretty much all of us think, German Chocolate cake does not come from Germany. In fact, it was originally called German's Chocolate cake after the American Sam German who developed a special kind of dark chocolate for Baker's Chocolate Company. They named the chocolate after him---Baker's German's Sweet Chocolate. That was in 1852. 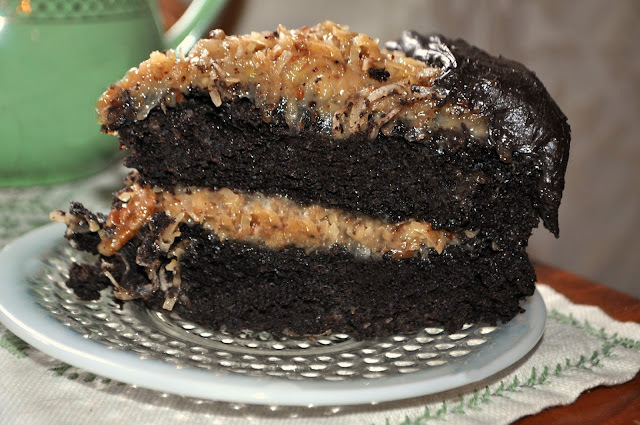 Over 100 years later, a homemaker from Texas submitted a cake recipe, German's Chocolate Cake, to her local newspaper and sales of the chocolate were boosted by almost 75%. The cake became a national tradition and the rest is history! Ready to try out my take on this American heritage recipe? Don't worry---you'll only need a small piece 'cause it's really rich! That's totally ok, though. Makes it last longer! Melt the butter and whisk in cocoa powder until well-combined. Whisk in the milk well, then add the sugars, eggs, and vanilla. When everything is smooth, set aside. *This mixture will seem really runny to you. Don't worry about it...it's going to be great. Trust me. Mix the flour, baking soda, baking powder, and salt and add to the wet mix, stirring until just combined. Divide into the three pans and bake 35-40 minutes or until a toothpick comes out barely moistened. Cool before loosening and removing from pans, then cool completely on a wire rack. Toast the pecans in a pan on the stove. Then whisk the sugar, milk, yolks, and butter together over med-high heat, and continue to whisk until the mixture is bubbling. Add the vanilla, pecans, and coconut. Allow the mixture to cool down quite a bit before filling the cake. Melt butter and mix in cocoa. Alternately add powdered sugar, vanilla, and milk, beating to desired consistency. Add small amount additional milk, if needed. This mixture is very much like ganache---but more frosting-y. Very awesome and very rich. Thanks for linking up to the Homemaking Party! This is the best thing I have ever seen come out of your kitchen, and I have seen lots of yummy stuff from you! Thanks for the party Sarah! I added your recipe to Yum. It looks amazing. I can't wait to try it!! Hope to see you again soon. WOW! That cake is SO decadent! Saved and pinned! I had no idea it wasn't from Germany! heehee! Your recipe looks scrumptious. It's been awhile since I've linked up anywhere and I'm so glad to be back! Thanks for hosting. The girls look so grown up having tea. Wish I was there too and have a piece of German Choc. Cake. I love it too and have a recipe myself, but will love to try yours! Thanks for sharing and for hosting this fun party dear Sarah. I'd love you to notify me the party by mail. I'm sorry I haven't been joining lately, my life has been a roller coaster all May and part of this one too! It definitely looks rich, but tasty too. I loved seeing the picture of the girls. They are so pretty. That sounds delicious! Thanks for hosting & God bless. Wow...that looks delish! Thank you for sharing your recipe and for hosting. Blessings.